Photography guide books and specials: get 25% off for 48 hours! If you've been eyeing a magazine subscription or photo guide book, the deals at Myfavouritemagazines online store offer some incredible savings. Whether for yourself or a family member or friend, a magazine subscription can offer a year's-worth of inspiration and advice - perfect for any enthusiast image-maker. And with a huge range of titles on offer, there's something for everyone, regardless of skill level and camera system. There are great general magazines for the enthusiast, and ones just aimed at Nikon and Canon photographers. There are beautifully printed magazines that are sent to your door – and ones that you can read on the move from your tablet or phone. Plus, for 48 hours only, you can get 25% off a huge selection of Specials and Guides using code READ25 at the checkout. Bookazines and guides - now 25% off! For 48 hours, you'll get 25% off ALL guides and specials on our online store using the code READ25 at the checkout. 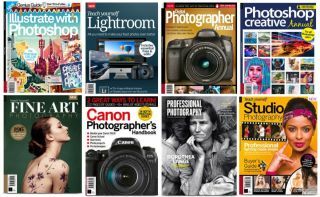 There are a huge number of photography guides and books available covering Fine Art, Wildlife, Studio Photography Outdoor, Lightroom, and loads more. Guide books devoted to Sony, Canon and Nikon are also available. Single issues of Professional Photography, training DVDs, and magazine binders are also featured and make fantastic gifts for photographers.